Throughout this last summer, people from across the western United States were telling us about monarchs they had seen. Particularly notable were the reports from places where monarchs are not usually seen, including Oregon’s Willamette Valley and even here in Portland. 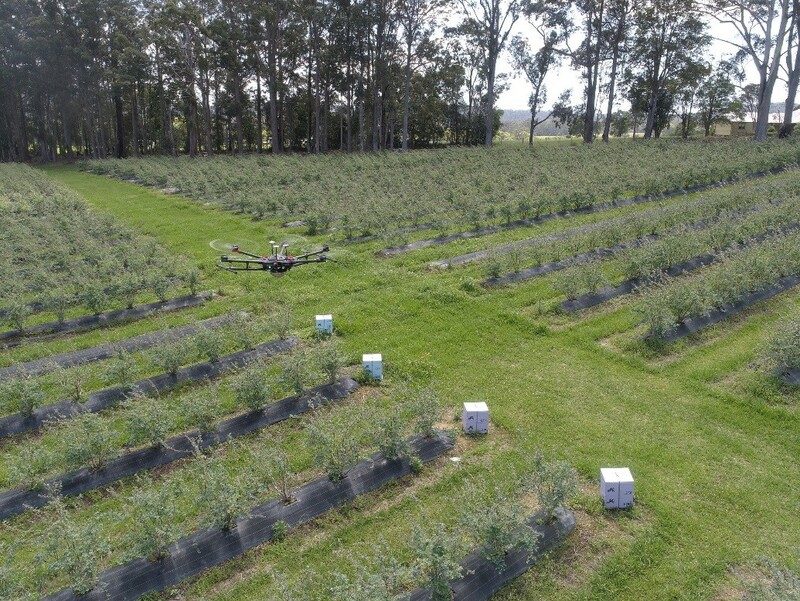 Coming at a time when there is a renewed interest in this remarkable long-distance traveler thanks the White House releasing a national pollinator health strategy and a petition to the U.S. Fish and Wildlife Service requesting legal protection, it hasn’t been entirely clear whether there are actually more monarchs or just more people noticing them. When monarchs are spread across a region stretching from southern British Columbia to Arizona, it is very difficult to assess how many butterflies there are. Most reports are anecdotal, with no way to compare numbers from one year to the next. However, the migration of monarchs provides a remarkable opportunity to gauge the health of the western monarch population. 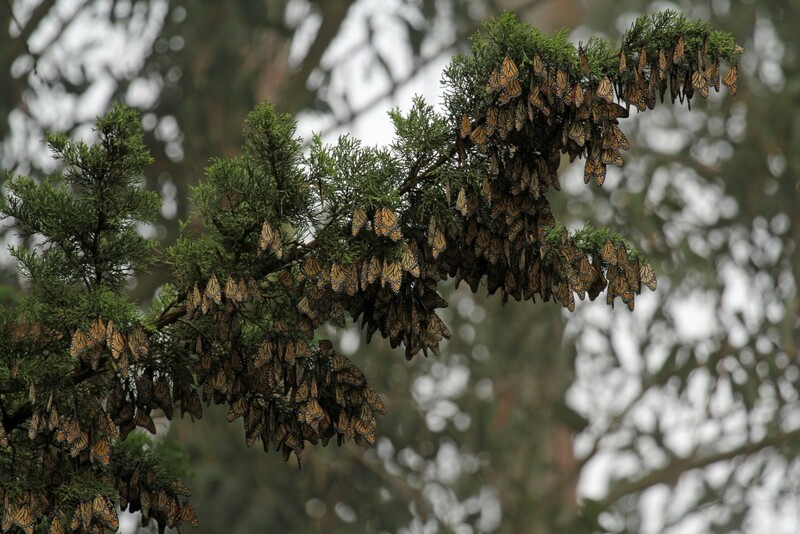 Because so many monarchs from the western United States converge on tree groves along the California coast, they can be counted while they are clustered together for the winter — and from the early reports from overwintering sites, it seems like 2015 may have been a better year for this beleaguered butterfly in the western United States. Monarch butterflies from a region stretching from southern British Columbia to Arizona congregate in groves along California’s coast to spend the winter. Counting them during this season enables an accurate assessment of the health of the western monarch population. 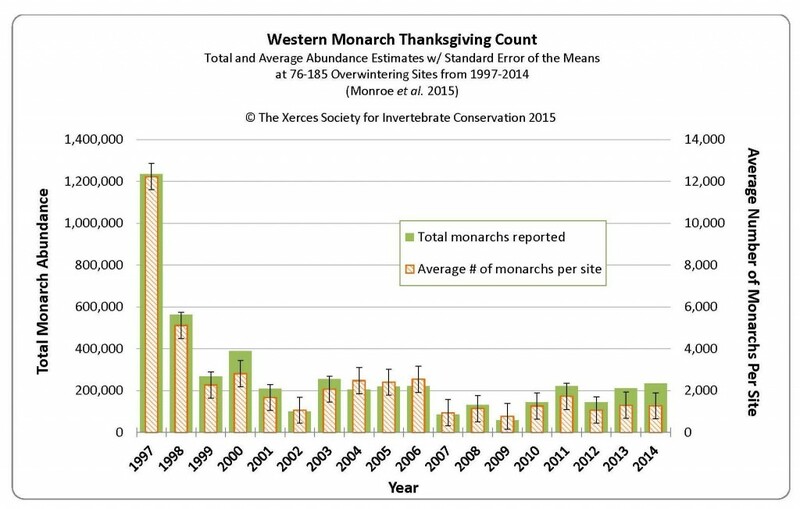 The Xerces Society began counting monarchs in 1997, when we launched the Western Monarch Thanksgiving Count. This count happens during a three-week period centered on Thanksgiving. Biologists, land managers, and citizen scientists visit overwintering sites year after year to monitor the butterflies. This effort is coordinated by Xerces staff and Mia Monroe, a long time Xerces volunteer. After 19 years, this is the longest running effort to monitor overwintering monarchs in California and the count has built a considerable data set that allows a year-on-year comparison of monarch numbers. I’m very happy that numbers seem to be higher at some of the northern California sites that have been surveyed, but monarch populations have not yet recovered in the western U.S.
Insect populations naturally fluctuate from year to year. It took years of monitoring to establish that the monarch population was suffering long-term decline and population numbers need to show a sustained increase over several years to demonstrate that the monarch is on its way to recovery. Though numbers are up at some California overwintering sites, the average number of monarchs per site is still far lower than numbers reported in the late 1990s, and the overall population is significantly smaller: In 1997, over 1.2 million monarchs were recorded; last year, fewer than 235,000. Since the first Western Monarch Thanksgiving Count in 1997, numbers of butterflies overwintering in California have fallen. Early data suggests that 2015 may be a better year for monarchs in some parts of the state. Until such time as there is evidence that the monarch butterfly is secure, we’ll continue our work on its behalf. The Xerces Society has the world’s largest pollinator conservation team, with several staff currently working on monarch conservation. Efforts include habitat restoration on farms throughout the country, national development of milkweed production best practices, restoration of overwintering sites in California, conservation and management of critical habitat across central and western U.S., and engagement of citizens in monarch research and protection. Our staff participate in the Federal Monarch Butterfly High Level Working Group, the USGS Monarch Science Partnership, and co-chair the Monarch Joint Venture. We collaborate with many federal and state agencies or contract and work closely with university researchers and other NGOs to advance the science and practice of monarch conservation. With so much going on, let’s not forget the insect that inspires us all. If you want to experience the phenomenon of the monarch migration, you can find places to see them in California at http://www.xerces.org/where-to-see-monarchs-in-california/. 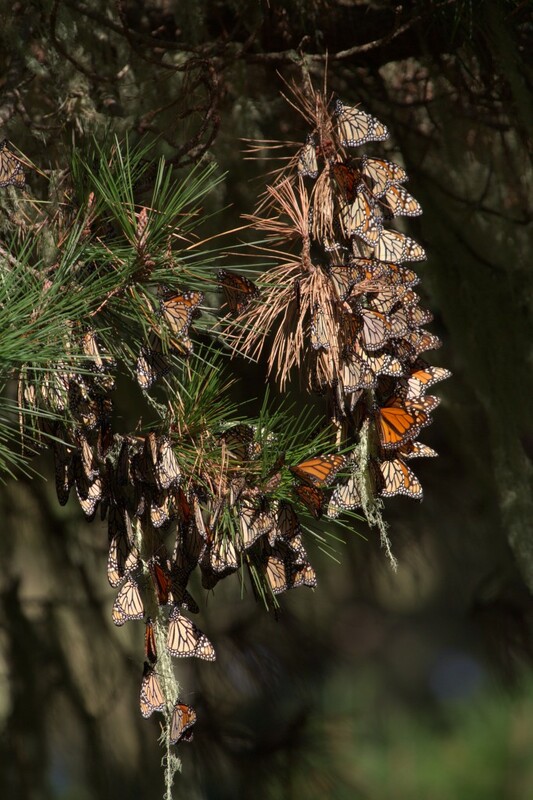 The sight of monarch butterflies clustering together for the winter is an experience unlike any other.